ROTTERDAM – A raucous crowd of over 9,000 fans filled the Ahoy arena to watch top Dutch MMA and Muay Thai fighters take on some of their counterparts from across the globe. The hometown crowd left with smiles on their faces as fan favorites Gilbert Yvel, Valentijn Overeem and Ernesto Hoost walked away with victories. Also, Muay Thai legend Roman Decker officially retired from Muay Thai competition after destroying Swiss fighter Marino de Florin. Gilbert Yvel (Ned) defeats Carlos Barreto (Brazil) by KO 2:20 of round one. Barreto had Yvel mounted a minute into the fight, yet the referee chose to stand up the fighters. Once back on the feet, Yvel clearly KO’d Barreto with a left hook to the chin, yet when Barreto pleaded to keep fighting the judges at ringside cleared it. 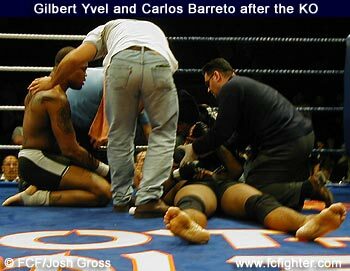 Yvel immediately pounced and blasted the Brazilian with a flying knee, effectively KO’ing Barreto for the second time. 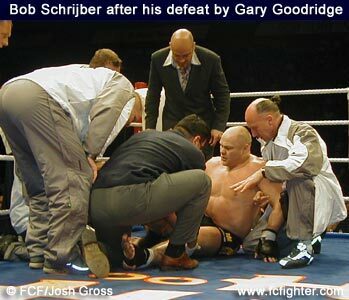 Gary Goodridge (Canada) defeats Bob Schrijber (Ned) by toe-hold submission 2:32 of round one. Goodridge didn’t throw three strikes the entire fight, none were right punches, yet managed to submit the tough Schrijber. Sem Schilt (Ned) drew Aliaksei Miadzvedzeu (Belarus). The fight featured the seven-foot Schilt on his back nearly the entire fight. Miadzvedzeu, a silver medalist Olympic wrestler, took the lanky Dutchman down 22 times during their 20-minute contest. Schilt landed a few knees and punches yet the fight was ruled a draw. Valentijn Overeem (Ned) defeats Ian Freeman (UK) by TKO 1:50 of round one after a cut above Freeman’s right eye. Fatih Kocamis (Germany) defeats Ed de Kruiyf (Ned) by KO 7:00 of round one. Martijn de Jong (Ned) defeats Tullio Costa (Brazil) by TKO from doctor stoppage 6:00 of round one. Allister Overeem (Ned) defeats Stasnuschik (Russia) by KO 0:53 of round one. Serge Bytchkov (Russia) defeats Ronny Rivano (Ned) by arm-triangle submission 4:40 of round one. Natalia Bobkova (Russia) defeats Irma Verhoef (Ned) by decision. Ernesto Hoost (Ned) defeats Xhavit Bajrami (Switzerland) by decision (K-1 rules). Roman Decker (Ned) defeats Marino de Florin (Switzerland) by KO 0:10 of the fourth round. Rayen Simson (Ned) defeats Karpin (Russia) by decision. Gilbert Ballentine (Ned) defeats Ridoun Assrouti by TKO from referee stoppage 2:55 of the third round. Ilonka Elmont (Ned) defeats Christina Horvai (Hungary) by decision. Samir Bennazouz (Ned) defeats Sean Pulcjak (Croatia) by KO 0:27 of the fourth round.